You’ve lots of choices for thermostats, especially when you’re buying for a low voltage based heating/cooling system like a central furnace or a boiler or a heat pump based system. But when it comes to choosing a baseboard heater thermostat, you don’t have wide range of options to choose from. One primary reason is that baseboard heaters are line voltage systems which uses direct electricity to heat your rooms. Energy bills would be high for baseboard heater systems unless you live in a state where electricity costs are very low. About 90% of America is running on low voltage systems and only about 10% of homes are using line voltage systems, like a baseboard heater. Most of the popular thermostat models (like Nest, Ecobee, Emerson Sensi) are incompatible to be used as an electric baseboard heater thermostat – as they’re designed for low voltage heating/cooling systems. In this article, we review the best electric baseboard heater thermostat models out there. We’ve listed the criteria and important points to check before choosing a baseboard heater thermostat. When it comes to an electric baseboard thermostat, you can choose from 3 or 4 different types. You can opt a smart thermostat for baseboard heaters – if you prefer all those high end features, or you can choose a WiFi thermostat for baseboard heaters – if internet based control is what you prefer, or if you don’t have that kind of a high budget for smart/WiFi models – you may opt for digital programmable thermostat for electric baseboard heaters. We’ve covered all of them, read on. The primary reason to buy and install a thermostat in your home is to regulate room temperatures and maintain your comfort levels. However, thermostats also helps to cut down energy bills and save money. In fact, investing in the right thermostat is the best way to save energy bills. The money invested in a thermostat will be regained within a few months of installation. Before getting to the reviews section, let’s first see how to choose the right electric baseboard heater thermostat for your home. Line Voltage or Low Voltage – The first and most important point – a “baseboard heater” is a line voltage device. You can’t use a low voltage thermostat (like Nest, Ecobee or other popular models used for furnaces or heat pumps) with a baseboard heater. A line voltage system uses direct line voltage (120 volts or 240 volts) unlike the newer low voltage models (which runs on 24 volts). Line voltage type thermostats are used in older homes and constructions (or in places where electricity costs are very low), especially with the baseboard heaters and electric heaters. The power wires are thicker and they run on 120 volts or 240 volts. Single Pole or Double Pole – A single pole thermostat connects to the electric mains via 2 wires. You can not shut the power to a single pole thermostat. As an alternative method (to shut power), you can set a very low temperature in the thermostat setting to prevent heat coming up to the room. Double pole thermostat connects to the electric mains via 4 wires. It is possible to shut power to the double pole thermostat system at any desired time. So double pole has an advantage over single pole. You can read our guide on Single Pole vs Double Pole to get more idea. Smart/WiFi Thermostat or Digital Programmable – A smart thermostat or a WiFi thermostat for electric baseboard heaters has its own benefits over an ordinary programmable thermostat. A smart thermostat has high end features like voice control, energy savings (save nearly 10% on annual energy bills), internet based control, geo fencing, auto scheduling and more. On a similar note, a WiFi thermostat can also be controlled via internet using your smartphones (they lack some features of a smart thermostat like geo fencing, voice control etc). An ordinary digital programmable thermostat don’t have any of these high end features but they still do the job of a thermostat perfectly. The key difference is price! If you don’t have the budget for a smart/WiFi model, always go for the programmable thermostat. If you go by data, only about 10% of homes in America relies on high voltage heating. This smaller market size may be one reason that there was no proper “smart thermostat” in market for line voltage systems like a baseboard heater. New innovative companies like MySa has put an end to this. 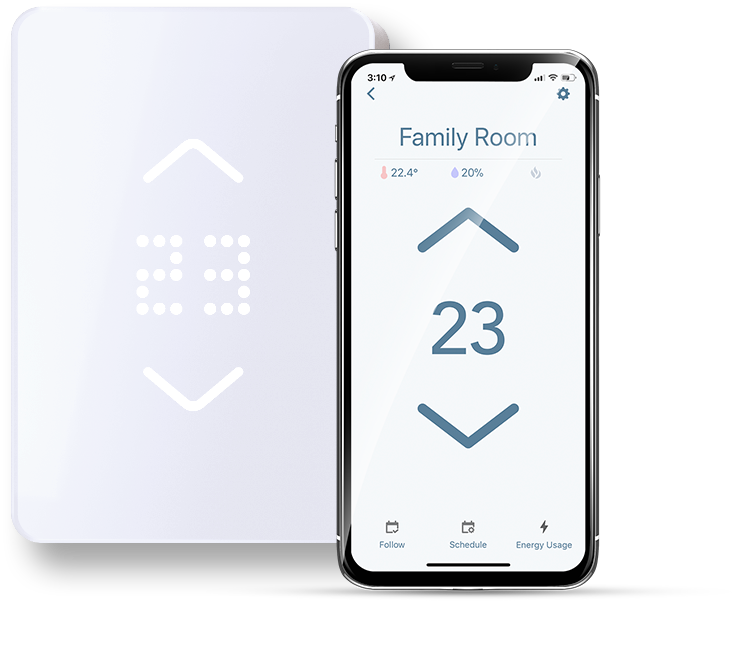 Now there are smart thermostats for electric baseboard heaters – with all useful features like Energy savings, Mobile App based scheduling, WiFi control, Zoning and a lot more. Let’s see in detail. As we’ve noted above, MySa is a smart thermostat for baseboard heaters, convectors (short cycle), fan forced convectors (long cycle), and radiant ceiling heating. MySa is smart thermostat in all sense with features like Energy savings, WiFi control, Integration with smart hubs ( Amazon Alexa, Google Assistant, Apple Homekit, Samsung SmartThings), Energy reports, Mobile app based control & scheduling, Vacation mode and a lot other essential features. Let’s begin the detailed review of baseboard heater thermostat models out there in the market. We have shortlisted the 7 top and best baseboard heater thermostat models based on user reviews and product features. Honeywell TL8230A1003 is one of the best selling programmable thermostat for baseboard heaters. 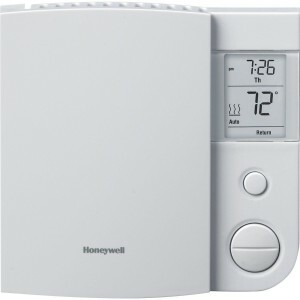 Honeywell TL8230A1003 is a 7 Day programmable thermostat for baseboard heaters and line voltage based heating systems. This model can give upto 20% savings on annual energy bills, if you use it with preset schedules pre programmed in the model. This is a 4 wire/double pole thermostat, which operates at 240/208 volts, 50/60 Hz frequency and can take upto 15 Amps (resistive) load. This means you should not choose this thermostat if your baseboard heater is 120 volts, or the load is not resistive (for ex: convection heater). This Honeywell baseboard heater thermostat has a large display with backlight, which makes it very clear and easy to use. Icons are provided to differentiate between modes like Night mode, Manual program, Away/Vacation mode etc. This model is very easy to program and you can create your own schedules if you prefer a custom program. Manual mode allows you to completely override pre programmed schedule and create your own. Schedules can be created for different times/hours for each day of the week (7 days). 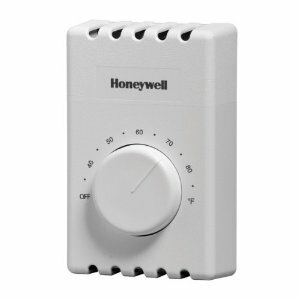 Note: Read the full review of Honeywell TL8230A1003 programmable baseboard heater thermostat. The ‘early start’ feature ensures scheduled temperature is reached within programmed time. This model is battery free and power is tapped from the same supply line for your baseboard heater. You don’t need to worry about periodical battery replacement or batteries draining out on a cold winter night. However, a con to this blessing is that, you’ve to reprogram the full schedules (only if you are using manual mode and custom schedules) on an unfortunate power outage anytime. Lux ELV4 – is a universally designed (single pole/double pole), 5-2 Day programmable, line voltage thermostat suitable to be used for baseboard heaters and other line volt systems. Lux ELV4 is a 5-2 day programmable line voltage thermostat, which can operate at 120/240 volts. It is universally designed to be wired as single pole or double pole. ELV4 is compatible to be used with baseboard heaters, radiant ceiling heaters, cable heaters and line voltage based hot water systems with motors upto 1/4 horse power. The manufacturer claims ELV4 can help save 33% on annual energy bills, when used with pre-programmed heating schedule. This model is 100% mercury free and is designed following environmental standards. ELV4 can manage upto 1900 watts at 120 volts (16 amps, resistive load) and upto 3800 watts at 240 volts. As mentioned above, this model can manage motors upto 1/4 hp for line volt hot water systems. You may read the full review of Lux ELV4, if you’re considering this model. RLV305A is a 5-2 day programmable, 2 wire/single pole line volt thermostat, which can operate at 120 volts/240 volts. 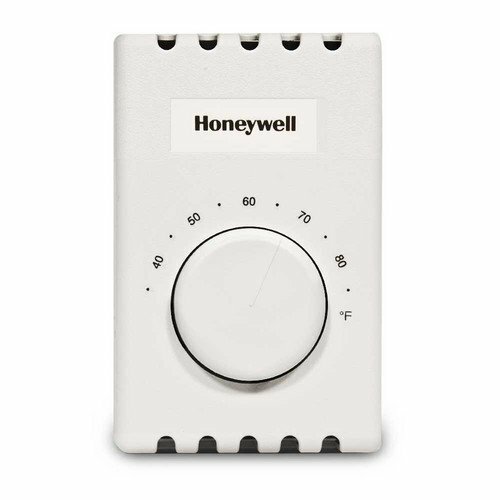 Honeywell RLV4305A1000 is a 5-2 day programmable thermostat for baseboard heaters, convectors, fan-forced heaters and radiant ceiling heaters. A 5-2 day programmable thermostat will have two program settings, one for weekdays and the other for weekends. Besides these two week based program settings, a single day can have 4 different settings for morning, mid-day, evening and night. Honeywell RLV305A1000 is a 2 wire/single pole thermostat, which can operate at two line voltages – 120 volts or 240 volts. A precise temperature control of +/-0.5°F is ensured with Triac based switching technology, which also facilitates silent switching operation. At 240 volts, a max load of 3500 watts can be handled. For resistive loads max current is 14.6 amperes, and the load should draw a minimum current of 0.83 amperes. You may read the full review of Honeywell RLV4305A1000 – to know more about all the features and technical specifications. Aube TH106 – is a single pole/2 wire digital thermostat, with 7 day programmable feature, which can operate at 120 volts/240 volts. 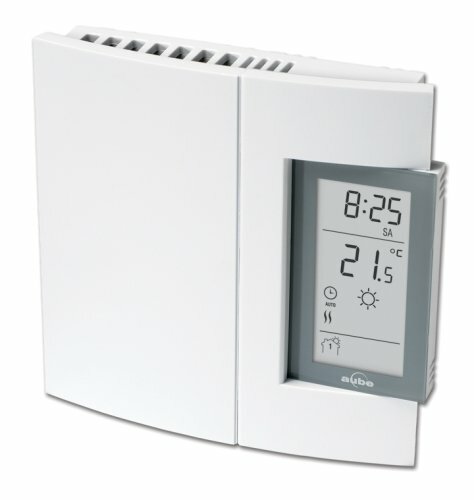 The Aube TH106 is a 7 day programmable, digital baseboard heater thermostat model from Honeywell. Apart from baseboard heaters, Aube TH106 is compatible with convectors, fan-forced heaters, and radiant ceiling heaters. This is a 2 wire thermostat (single pole thermostat) which can operate at 120 volts or 240 volts (line voltage). At 120 volts, this thermostat can manage 2000 watts output load, at 16.7 amperes (resistive load). At 240 volts, this model can manage 4000 watts output load, at 16.7 amperes (resistive load). The frequency being 60 Hertz in both cases. The load should be minimum of 2 amperes for the thermostat to function properly. Note: Read the full review of Aube TH106 – digital baseboard heater thermostat. King ESP is a 7 day programmable baseboard heater thermostat, which has an output rating of 22 amps and can handle a load of 2640 watts @ 120 volts and 5280 watts @ 240 volts. King ESP baseboard heater thermostats are available in 2 variants – 120 volts and 240 volts. Both models are 7 day programmable. You can program each day (of the week) individually and 4 schedules can be set for each day. The temperature set point ranges from 44°F to 95°F. It is provided with memory back-up in case of power outages, so that you don’t need to reprogram the device. What sets apart King ESP thermostats from other models is its power & current rating. King ESP thermostats can handle upto 22 amps current (most popular baseboard thermostats are designed for 16 amps). The max load is 5280 watts @ 240 volts and 2640 watts @ 120 volts, which is also higher than other thermostat models. So if you’re looking for a thermostat with higher output capabilities, consider King ESP. 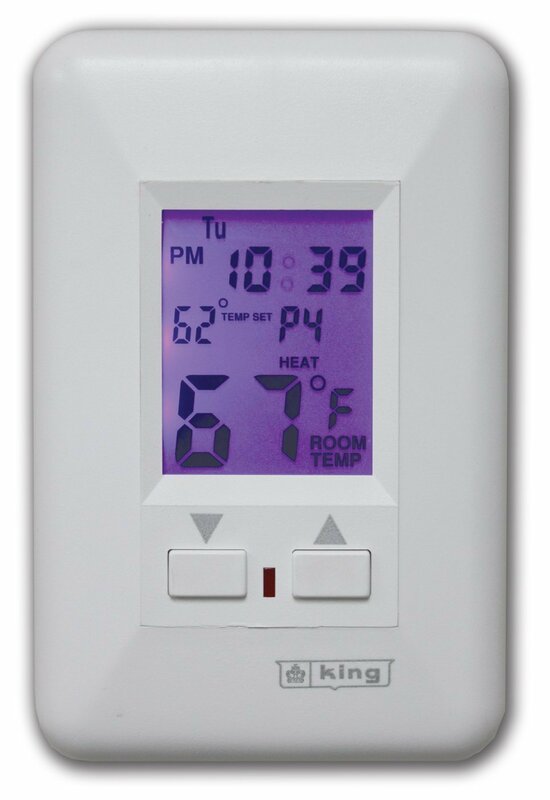 Read our full review of King ESP thermostats – which covers all technical details and features. The Honeywell Manual Electric Baseboard Thermostat is very easy to install and works on all 4-wire (double pole) electric heat applications, that is, baseboard or line volt and enables simple and hassle-free operation. The device has a simple dial-type mechanical control. Besides, it is UL and CSA listed for safety. This baseboard heater thermostat is a standard model and can be used for baseboards and convectors of 120 to 240 V. It is a non-programmable thermostat that is easy to use. There is a bi-metal temperature sensor provided. The gadget is compatible with baseboards and convectors. It can control up to about 5280 Watts. It features positive off option. Moreover, the device is completely Mercury-free. This Honeywell model is easy to use and easy to install. It comes in a very affordable price of $15.99. It is said that the device is not very accurate at low temperature setting. 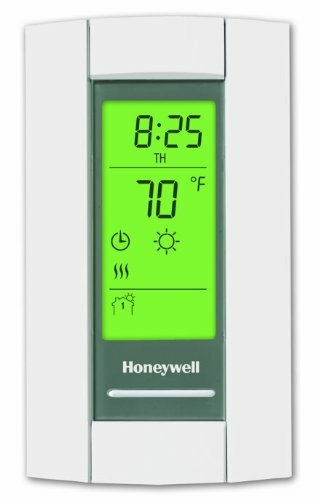 This digital non-programmable thermostat meant for electric baseboard heating from Honeywell is easy to install as well as use so as to gain control over your home temperature. The TRIAC switching allows accurate temperature control of +/- 0.5 degrees Fahrenheit. The device operates quietly without any kind of irritating clicking noise. This Honeywell model is compatible with electric baseboards of 120-240 volt, convectors and radiant ceilings. The thermostat sports an LCD display and an on-screen heating command indicator. You would like the way this thermostat adjusts power usage by not passing over the full power to the heater. Besides, it has five vertical bars that indicate the following: 5 – 100%; 4 – 80%; 3 – 60%; 2 – 40%; 1 – 20% and 0 – Off. Also, the gadget is very much energy efficient. The price of the device is very reasonable at $29.39. The only drawback is that the wiring is small gauge/diameter and so has restrictions on how many watts/baseboard heaters it can control. 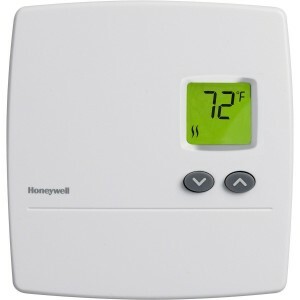 Honeywell RLV3100A is a non-programmable in-line Voltage control Baseboard Thermostat. This model is pretty easy to install and use. Comes equipped with a backlit screen so that the user can easily see the temperature readings even in dark lights.Precise temperature control in Fahrenheit and Celsius by TRIAC silent switch. This model is compatible with 240V heat, convectors, 2-wired radiant ceilings and perhaps doesn’t support heaters that are fan forced. This Electronic Thermostat has high capacity of almost 3000W at 240V AC Voltage. The great simplicity of this Honeywell model, when combined with its Electrical features, make a perfect choice to save your Electricity bills and the money which would otherwise be spent on paying high Electricity bills. The size of this RLV3100A is W X D X H 4.8 x 1.2 x 5 inches. This Compact design can easily fit anywhere in any of your room. This Honeywell model comes with a limited warranty of 1 year. You can easily verify the settings of this unit with your home heating and cooling system and then install the unit without any hassle. Attractive design easily catches the customer’s eye at the first glance. Reduces Electricity bill to a considerable amount. Simple to use device has no complicated operating procedures. Has been certified as an Energy saving Thermostat. No batteries required for its operations so the model is maintenance-free. Backlight feature execution once in a while and not all the time. Limited temperature swings of 3 degrees. Only two wires are provided for the connection which makes it difficult for the user to understand which wire should be connected with the other equipment. 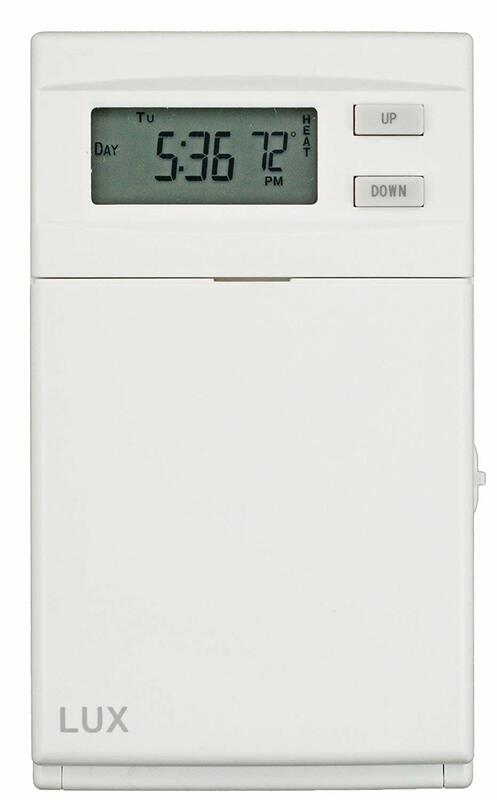 Honeywell TL7235A1003 is a Line Voltage control non-programmable Thermostat unit with digital support. This system controls resistive loads at 208/240 V AC Voltage. Used for controlling products like radiant ceiling heat, convectors, radiant floor heat, and fan forced heaters. Some of the usage instructions are provided in the Instruction Manual and if any person follows our Instruction, then believe us approximately 10% on an annually heating cost can be saved on the electricity bills. However, the saving percentage may differ from region to region and the amount of usage of this unit. It has been seen that Digital Non-programmable unit at temperature precision of 1 ºF can save approx.10% on your heating bills. Its large and clear display screen with back lit is easy to read the temperature reading even in dark or no light condition. Soundproof and quiet operation reduces unwanted noise which irritated most of the consumers while using conventional thermostats. 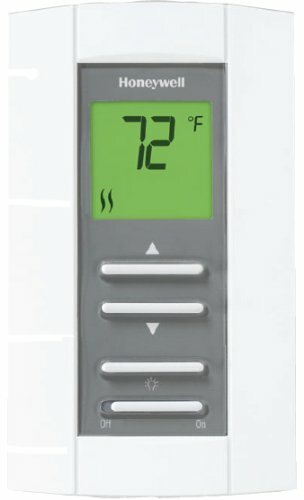 This model comes with an On/Off switch that allows the user to turn on/off the thermostat settings when according to the season like the settings can be turned off at the end of the summer season. This feature is unique to this model. Heating Indicator clearly indicates whether the heat is on or not. The unit doesn’t not require any battery and so no Maintenance is required. The size of this unit is not so big H X W X D 4-7/8in x 2-3/4in x 7/8 in. The premier white color gives your home a rich and elegant look. Easy to install. You don’t need to buy any extra item for installation. Precise and modern-designed keeping latest trends in view. ON/OFF switch provided to turn on/off the unit in the case of off season. The unit comes with a limited warranty of 5 years so buy this unit once and relax for at least 5 years. Heat level indicator and the duty cycle are sometimes weird to understand. When the temperature is set and no heating icon is available then many times, baseboard till pumps out the heat. Honeywell T410A1013 is the Economy model of Honeywell Baseboard thermostats series and provides the smooth line-voltage control of the Electrical heating equipment. When the temperature falls, Snap-action switch SPST creates a heating circuit. This model has virtually replaced the .T410A two-wire and T410B four-wire wall mounted thermostats models. It is perhaps easy to install and comes with a flexible 6-inches long Leads with different colorcodes for proper electrical connections to aluminum wires that are CO/ALR approved. This Honeywell model is robust in construction and plastic base for mounting. Its single piece covers with vents do not allow it to overheat. This T410A1013 model is considered best for new appliances used in the construction field. This model is a true value for money product. You don’t need to go through Instruction manual to understand how this easy model operates. This model is only SPST and does not support DPST. Here in thermostatguide, we have reviewed the best collection of touchscreen thermostats.Read our detailed review. Which thermostat makes the best choice? If you are looking for the best baseboard heater thermostat with comprehensive features, HONEYWELL TL8230A1003 Thermostat Electric Heat Digital 7 day programmable Thermostat should be the best pick. On the other hand, if you need limited features with efficient energy saving capabilities as well as a budget-friendly option, Honeywell Manual Electric Baseboard Thermostat is the ideal choice. 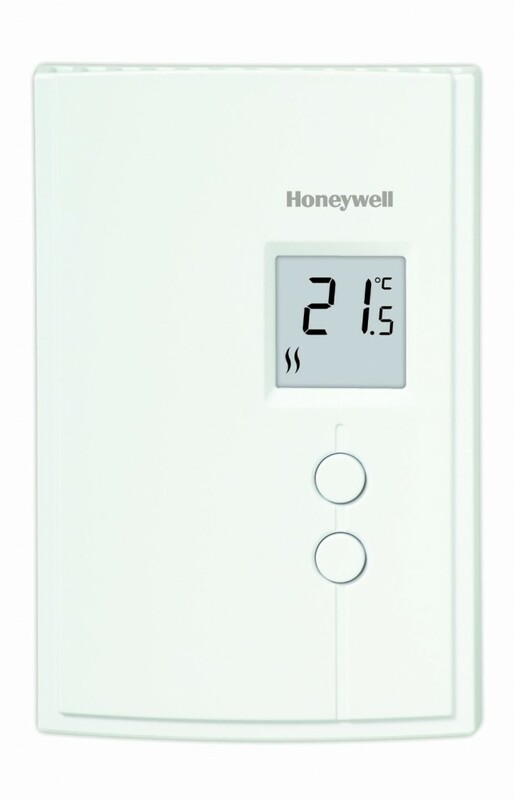 If you are keen on programmable baseboard heater thermostats, you can choose between Honeywell RLV4305A1000/E 5-2 Day Programmable Thermostat and HONEYWELL TL8230A1003 Thermostat Electric Heat Digital 7 day programmable Thermostat; however, the former one is a comparatively cheaper option. And not to forget, you get what you pay for. So, ultimately, the HONEYWELL TL8230A1003 model is a clear winner. Note: – If you are interested in other digital thermostat models, read our article on the Best Digital Thermostat Reviews. #1 Which one is good – a mechanical or electronic thermostat for baseboard heaters ? Mechanical or Electronic – A mechanical thermostat operates with two bonded metals which bend as temperature changes. The switche will turn ON/OFF as the bonded metal bends towards it. Mechanical thermostats lack efficiency and they waste a lot of energy compared to electronic models. The only advantage of mechanical thermostat is its low price. Electronic thermostats come with high precision temperature sensors and fast switching. They sense room temperature and turn ON/OFF the system accordingly. Electronic models are highly effeicient and they save energy. The higher price you pay for an electronic model can be regained within a few months of installation. #2 Which one of the two – a Programmable or Non Programmable baseboard heater thermostat ? Programmable or Non-Programmable – The primary difference between the two is that a programmable model can be programmed for 7 days in different combinations like 5-2, 2-2-1, 7 etc. Programmable thermostats adjust itself according to the program. For example, some models have “vacation mode” and if this mode is set, the thermostat will adjust itself and save a lot of energy bills (in vacation mode they work only minimal time preventing freeze). Nonprogrammable models come at a lesser price but they dont have programming capabilities. Hi Tom, Unfortunately there are no baseboard heater thermostats which support additional sensor interfacing. What you can do is, install the thermostat in the nearest possible spot/area where you want temperature to be regulated. You don’t need to place the thermostat exactly near the heater. In most cases, temperature is going to be uniform throughout the home. FAHRENHEIT Model #F2546NWC 240/208 V Amps 6.3/5.6 WATTS 1500/1150 . I would like something I can control with my iphone if its possible. @Kenneth – You can replace an old Federal Pacific thermostat with any double pole line voltage thermostat models.You can choose any of the model listed in this article (which are baseboard heater thermostats) or you can see more options in our article for line voltage thermostats. If you need control with iPhone, choose MySa thermostat (the best smart thermostat for baseboard heaters or radiant heaters). You can also choose any WiFi enabled thermostat (for iphone control) designed for line volt systems. Awesome! Thank you again for your help. two of my baseboard heaters are controlled by knobs on the units themselves, rather than thermostats. I would like to control them with wireless thermostats, rather than have to fish wires through walls. Any recommendations? Thanks. @Nathan, A wireless thermostat doesn’t actually mean “no wiring” between thermostat and your baseboard heater. A ‘wireless thermostat’ technically means that you can control this thermostat ‘wireless’ using a remote or a mobile app. Keeping this in mind, “MySa” would be a great choice.